Lilith's a divorced woman trying to make a living with her daughter, her niece and her step-sister who just wouldn't get out of the house to find a job for herself. What could be worse than being knocked down by the car and died? If only it ended there. But no, she went to hell after dying and found out about her terrible family curse--the females in her family were to be succubus due to some contract her ancestor signed with the Devil. Lilith was forced to work for the Devil. The plus point for this arrangement? She got to go back to the living again. If you think that's the end of the story, think again. She has to go on missions at unexpected times and faced the wrath of her "boss" when she failed them as she just couldn't get past herself to do bad things. It just wasn't in her nature. At times, things happened at home when she wasn't around and it was dangerous for the kids who were unsupervised. Of course there's a man in every book. 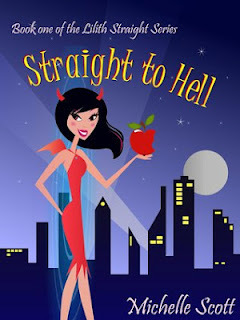 In straight to Hell, there's William but there wasn't really much going between him and Lilith or was there? Just read it yourself to find out! Will Lilith give up her family to continue her job as a succubus? Or will she fight for her family and for a way to survive? Read Straight to Hell by Michelle Scott to find out. Overall: There's a touch of humor here and there in Straight to Hell, making it an interesting read. The daily struggle with kids and life is realistic and easily relatable. In my opinion, the plot is pretty original but there's just something that doesn't really suits me. I wonder if it is the devilish content? Purposely making/forcing the main character do some bad things. No harm giving this book a try if you are interested though. It has some potential in it. I'll probably wait for some reviews for the second book first before deciding if I want to continue with the series. 3/5 Stars for Straight to Hell. I really like the cover :) It looks interesting. This cover is definitely better. It's the cover for the Paperback though. The ebook cover isn't really this nice.. Click here to go to the Goodreads ebook summary for this title.. Not as good right?